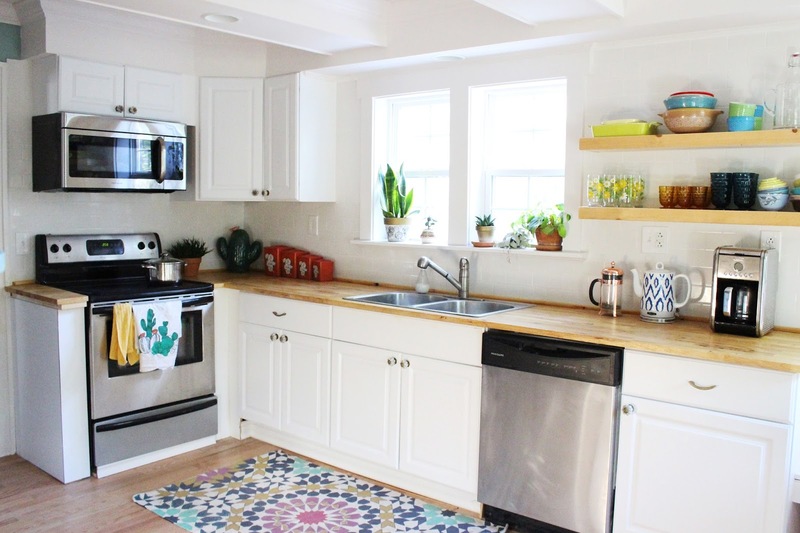 Guys, sorry to brag but holy moly how much do you love our kitchen?!?!?!?!?! We are so in love. 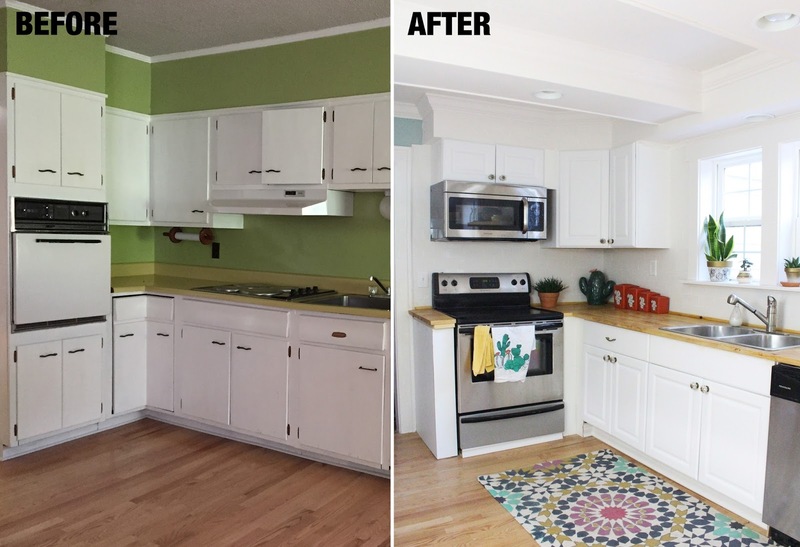 You cannot even imagine the pain + suffering that was involved with this kitchen, but we are ecstatic with the results. My (Casey's) parents bought this house to renovate and we are renting it from them. We were so fortunate to be able to make requests and suggestions instead of having to rent a place as is. My stepfather, Richard, is contractor, so he did all of the remodeling. Obviously, that was a huge cost saver for my parents! This side by side view really shows the extreme changes. We will eventually be sharing all of our house with you, but we are starting with the one thing that is complete already! Originally all of these cabinets were going to stay put, but after much consideration we decided that they needed to be ripped out. There were a lot of issues going on behind them. 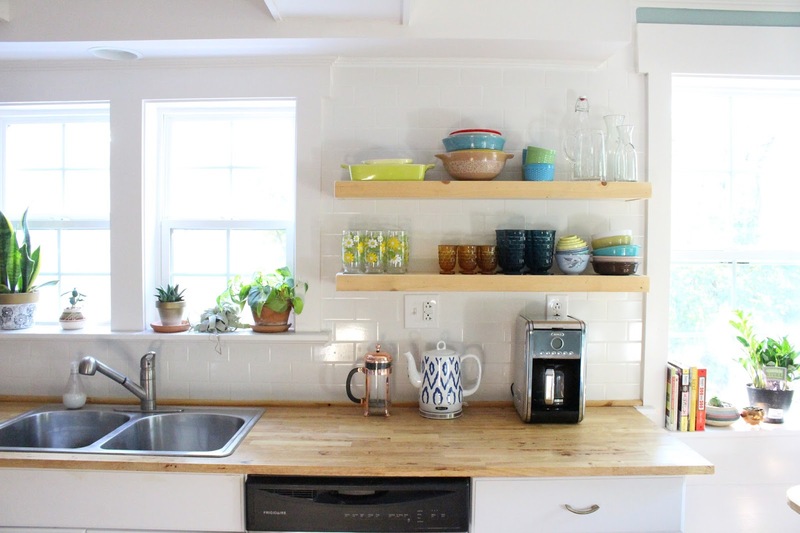 We knew we wanted wood counter tops and got a great deal on these. At first we thought it wasn't going to be possible due to the care needed for the wood, but my stepdad knew about this wonderful stuff called Waterlox. Its. Amazing. It completely seals the woods, never allowing water to seep through. We've tested it. It's great! We had to be creative with the space in the lower corner. 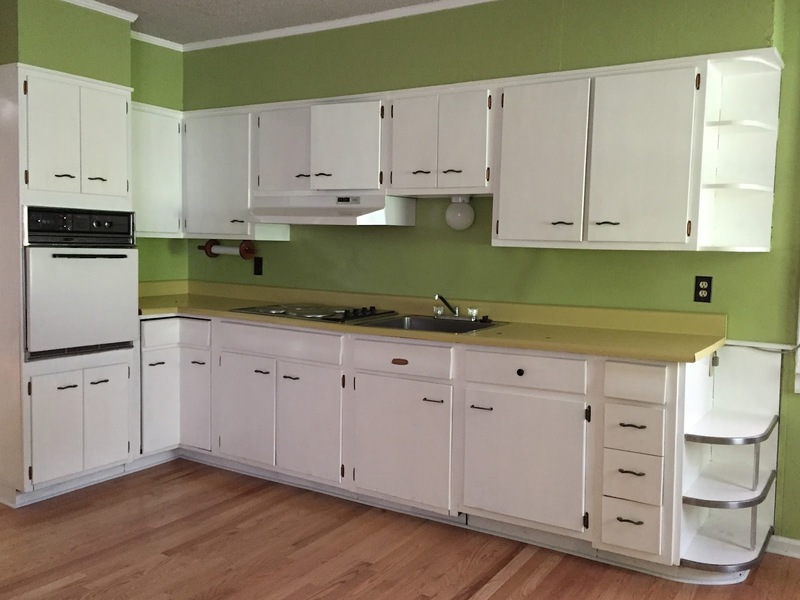 There weren't any cabinets that would allow us to use the space and since custom cabinets were not an option, there is just dead space. We have plenty of storage space elsewhere in the kitchen, so it works. Also, we realized that there were 2 windows hidden behind the upper cabinets. Blasphemy! The windows were older than dirt, so they had to be replaced. That also meant that we wouldn't have as many cabinets, but we were okay with that sacrifice. In the back by that window the previous owner had a washer + dryer. How European of her, but no thank you for these ladies. 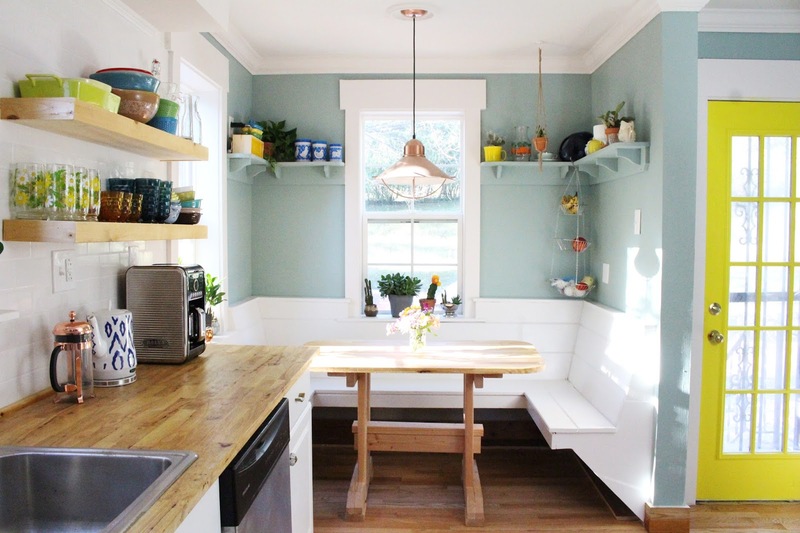 Don't you think a breakfast nook is a much better use of the space? We eat breakfast here every morning and it is so delightful. We relocated the washer + dryer to our studio space which will show you pictures of in the future. There are also new windows here. The window on the left originally had an A/C unit that had dripped over time and rotted the wood under the window. When Richard went to replace the window, the old one literally fell out of the house. SMH. He put up a shelf over the bench and we were initially unsure about it, but it's a great place for plants and knick knacks. He also made the table in the breakfast nook. The top is made from the leftover counter top wood and is sealed the same way. 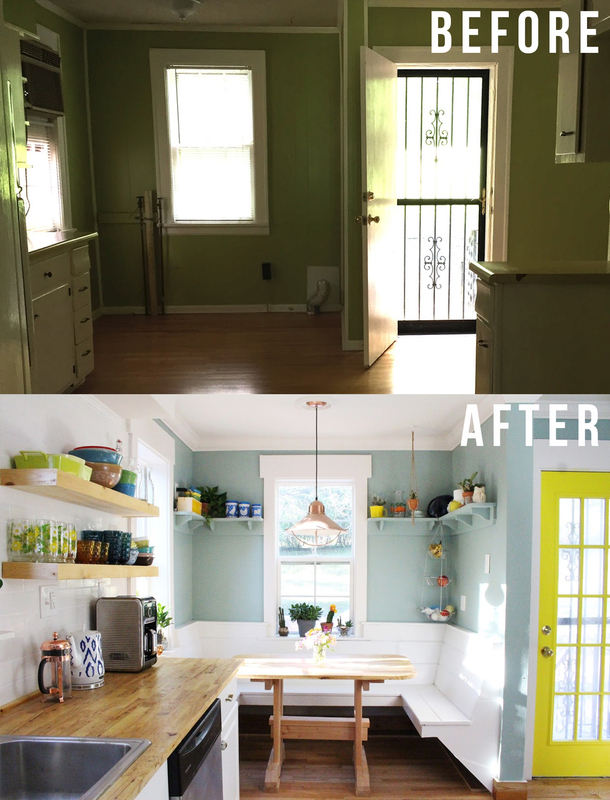 Richard replaced the door in the kitchen with this one that allows way more light in. Before, there was a solid wood door that was put on wrong and would only stay closed if you locked it. 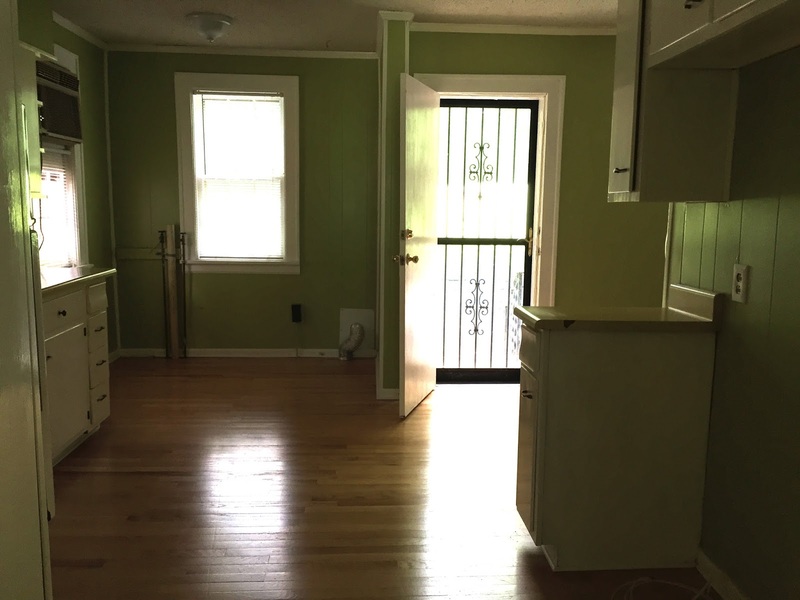 The new door was originally a beige color that did not work in this room, so we painted it bright yellow for a little accent. 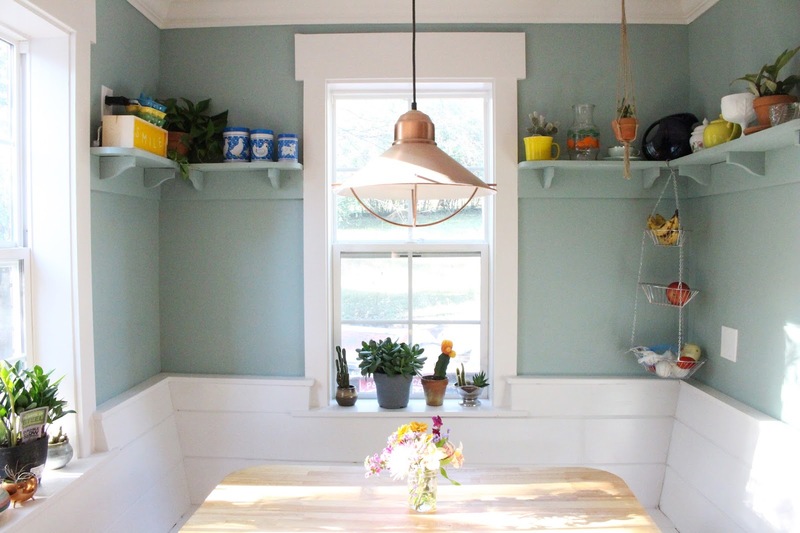 This light fixture was one of the first things we purchased for the kitchen. We love it so much and then we wanted to buy everything in copper. The kitchen opened into this random room. I'm not sure what the previous owner used it for but we thought it would be much better used as a bedroom, so we added a wall here and you will see below what we put in its place. 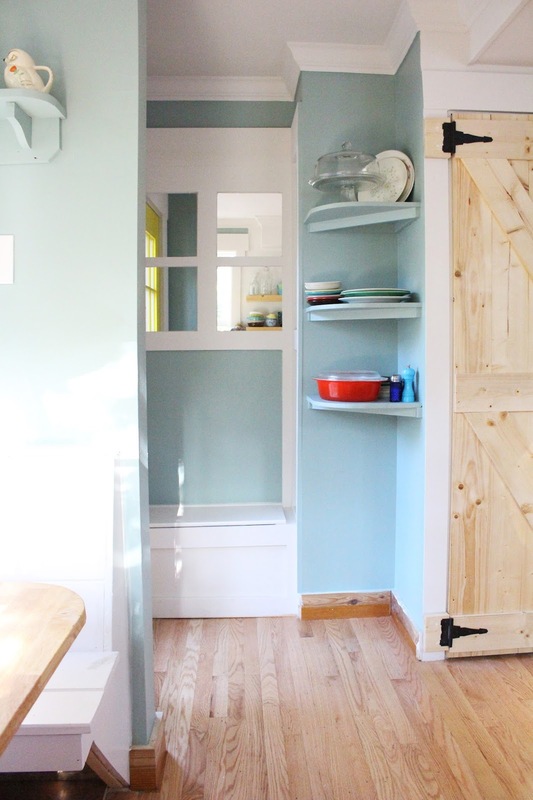 Hello pantry + hall tree + shelving! We haven't had an actual pantry in ages. 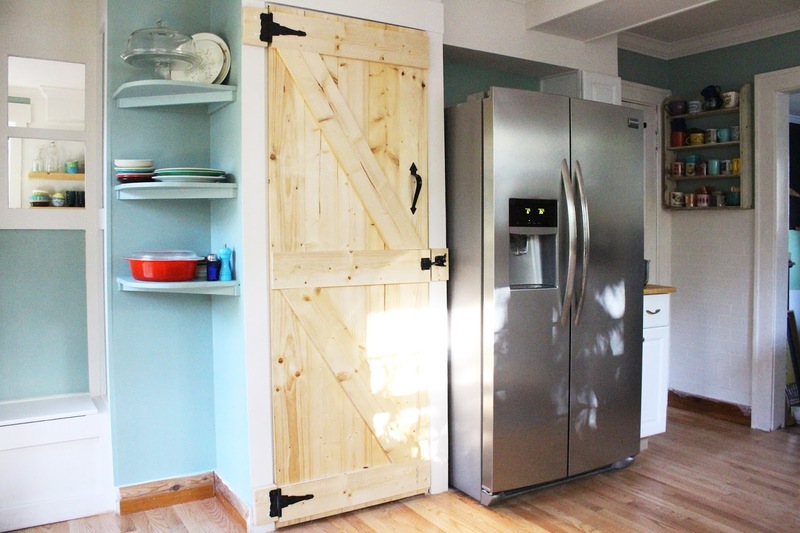 We love this barn door Richard added. It's such a nice touch. Our curated coffee cup collection. Say that 3 times fast! Whew. We had this in our last house and we knew it would have to come to the new space. This is the room that is attached to the kitchen and is now Savannah's bedroom. Pictures of of our bedrooms to come in the future. This is the new wall that created a room on the other side, rather than a strange kitchen addition space. The bench in the hall tree provides extra storage. 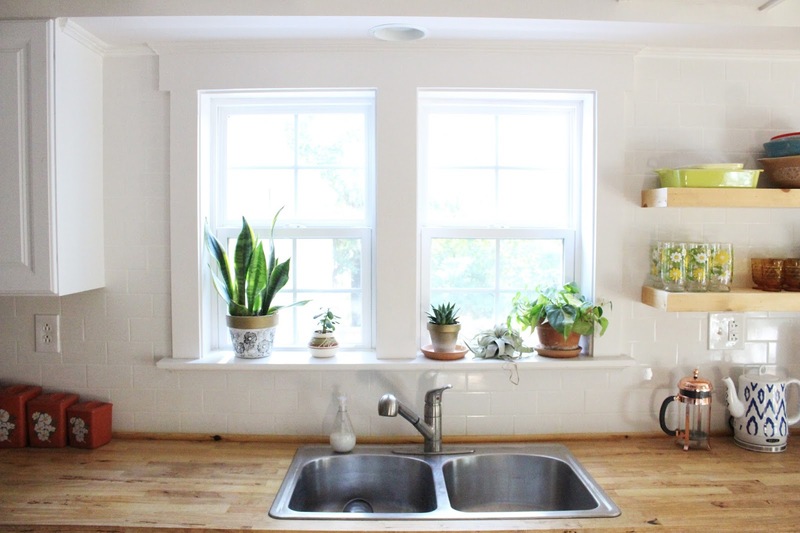 Total worth having these windows instead of cabinets. What we love most about our new windows is that the window sills are so deep! 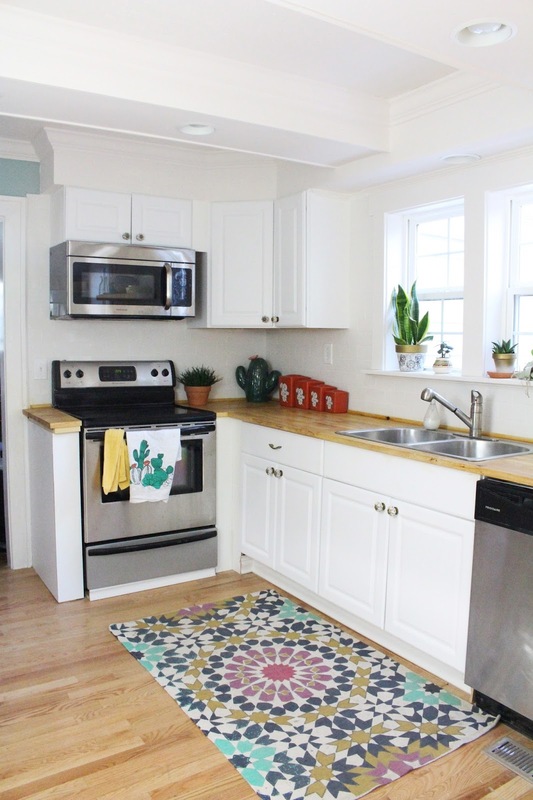 We are so excited to be able to utilize that space for plants, of course. 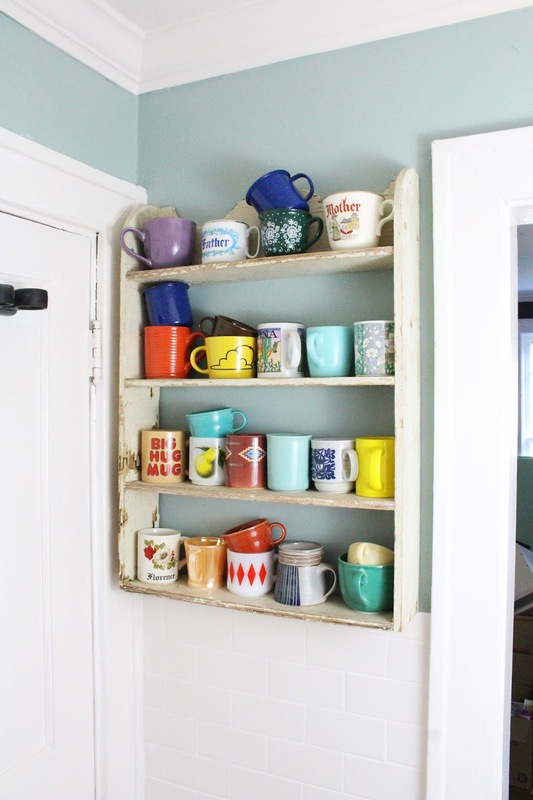 We are going to try to tell you where we got most of the things in our kitchen, but we may forget/ not remember/ have made it ourselves/ thrifted it. It's been a whirlwind trying to gather everything we needed to pull this off! Thank you! Hang in there, it will totally be worth it! 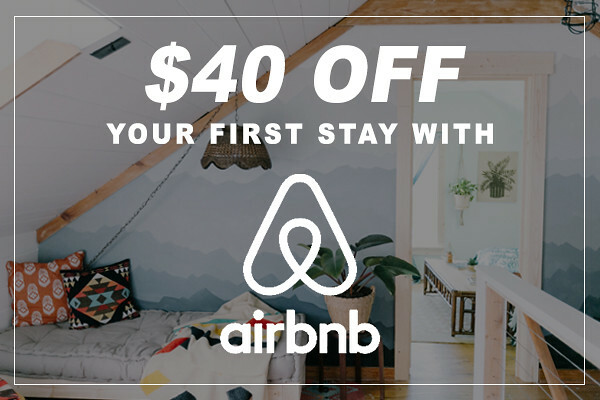 What color/ brand is that paint on the walls? I love it! At Classic Quartz Stone we create a established effort to create top quality Quartz Countertops & Worktops to use in houses and commercially.